The Albright knot, also known as the Albright special knot joins 2 fishing lines of different materials and diameters together. The line to line connections could be monofilament to braided, Spectra/braided to wire, mono to single strand wire, braid to braid, mono to fluoro, mono to mono etc. It is commonly used to unite fly line to backing. It slides smoothly through the guides when a fish pulls out a lot of line so as to reach your backing. For fly fishermen it provides a great option to connect Dacron backing to fly line. It was originally invented for tarpon fishing by a well known Florida Keys guide, Jimmy Albright in the 1950’s. The blue loop in step 1 should be made with the heavier line. When you already have a loop knot in the main line like the Bimini twist, surgeon’s loop or spider hitch, it makes good sense to have this knot for splicing the leader. Can join a copper fishing line to leader. You can put in some super glue for added security. Swivel, hook or any other hardware is not required at the junction. The uni knot is different as it connects the line to a hook. It can be used with leadcore. Securing the knot with a 3-turn uni lock prevents slipping and ensures smooth passage through guides. The FG knot was found to possess greater breaking strength. The Bristol knot combined with the Bimini twist creates fine light-tackle line to leader connections in contrast to the Albright knot that splices the main line to a heavier leader. 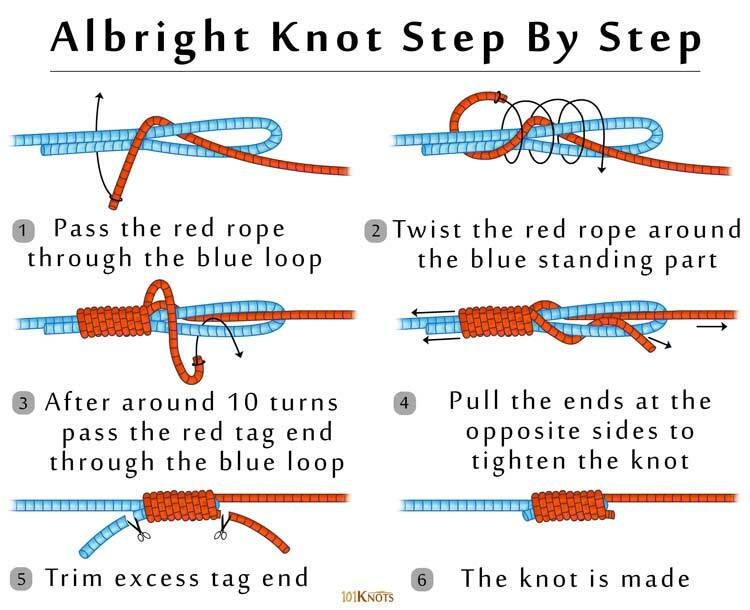 Improved Albright knot – Easier and stronger. 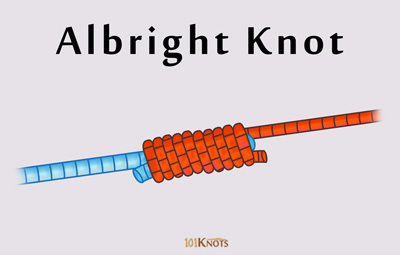 Modified Albright knot – Also known as the Alberto knot it is fairly easy to tie and is extremely strong. Recommended for joining braid to leader. As per tests, has a higher breaking strength for braid to fluoro. Double Albright knot – Connects a braided line to mono or fluoro. Reverse Albright/Yucatan knot – Employs 5-6 wraps for a mono main line and 10-12 wraps for a braided main line around the leader. Deemed the strongest mono to braided line knot. Great for attaching fly line to leader. You will find the video to be different from the diagram in just 1 respect, the locking knot shown towards the end. Note that it is optional. Nail knot – It is more suitable for smaller fish unlike the Albright that works well with bigger fishes too. Double uni knot (uni-to-uni knot) – Fails less in braid to fluoro and passes through the guides more easily. Blood knot – Joins lines of same diameters. Slim beauty knot – Tougher to tie.